“Preacher” of evolution Eugenie Scott lectures on science and religion. What’s our take? 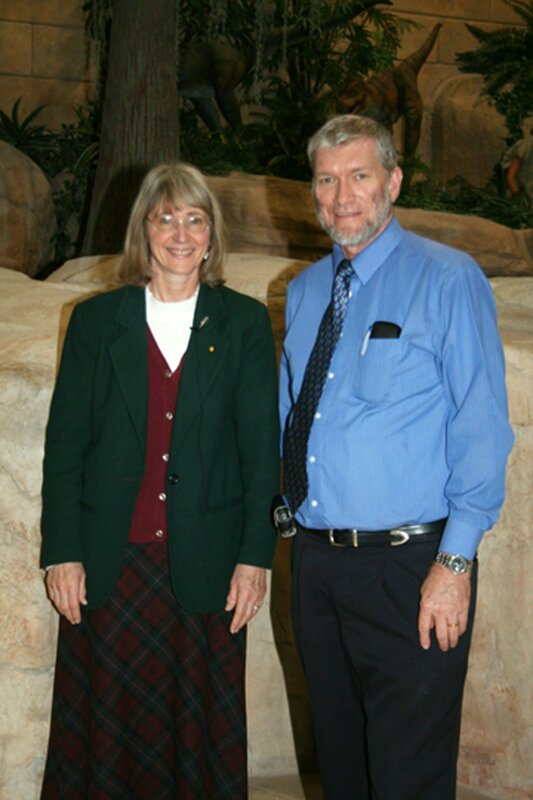 An odd couple: Eugenie Scott with Ken Ham at the Creation Museum last year. On September 10, 2008, Eugenie Scott, well-known executive director of the evolution-defending National Center for Science Education, spoke at Miami University, located an hour north of our Creation Museum. Her talk, “Science and Religion as Ways of Knowing,” was presented as the first of the year’s Religion and Community lecture series, put on by the university’s Center for American and World Cultures. I attended the lecture eager to hear how Scott, whose background is in physical anthropology, would treat the topic of religion, since she is an avowed secular humanist. I was also interested to what extent the creation/evolution controversy would play a part in the lecture. Scott didn’t leave me disappointed. 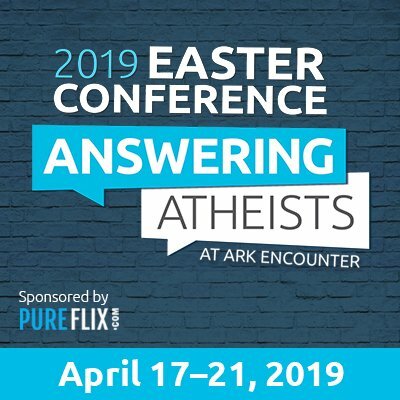 Previously, Scott has debated AiG president Ken Ham and AiG astrophysicist Jason Lisle. She has visited (part one | part two) and spoken about the Creation Museum and Answers in Genesis. Her organization even produced a problematic critique of the Creation Museum. After introductions, Scott rose to the stage as the crowd applauded, then she activated a PowerPoint presentation. “Science and Religion as Ways of Knowing,” the screen declared as she began her introduction. I sat back and mentally shook my head: just what was I in for? Scott briefly reviewed what her talk would cover, committing two minor errors in the summary that I couldn’t help but jot down. First, Scott referred semi-incorrectly to the “constitutional separation of church and state,” even though (as many are aware) neither the phrase “separation of church and state” nor the exact concept is in the U.S. Constitution.2 Second, Scott slipped in the phrase “evolution and creationism,” a misnomer likely intended to vilify belief in special creation as an “-ism,” as opposed to the supposed factuality of “evolution” (no “-ism”). Of course, both semantic mistakes are commonly made by the media, politicians, and many others. Personal state or insight—a.k.a. intuition or internal knowledge; Scott specifically discussed the propensity for this form of knowledge among charismatic Christians. Authority—which, according to Scott, we have evolutionarily adapted into following. Scott also identified revelation as a subset of authority. She acknowledged that even she takes “a lot of things” on authority, such as physics. Science—a “limited way of knowing” that, she said, can only explain the natural world using natural processes. In her explication of knowledge based on authority, Scott noted that while she may take a physicist’s word on physics, she is confident that, if she wanted to, she could learn the math and follow the reasoning of a physicist, verifying his or her conclusions; thus, according to her, this difference separates learned authority from revealed authority. Of course, that’s true; Scott couldn’t put herself in God’s shoes to independently verify His accuracy in Scripture. Scott’s conclusion—that experimental testing, through the establishment of control and test groups, double-blinding, and the like, makes for good science—is one we wholeheartedly agree with. While it’s true that many people don’t understand the scientific method, we at Answers in Genesis are fully familiar with and very supportive of the method. Yet the example Scott used next takes us from complete agreement all the way to the heart of our very big disagreement. A very familiar face appeared on the screen in front of the auditorium: a dated picture of our very own Ken Ham. It seems Eugenie Scott objects to a question Ham frequently and famously asks: “Were you there?” As many of our supporters know, the question, based on God’s monologue to Job, is a reminder that humans are fallible beings who weren’t present to observe the first five days of Creation Week; on the other hand, Genesis claims to be the Word of an omniscient God who was there. According to Scott, however, the “were you there?” question represents a rejection of scientific inquiry into the past and shows that creationists have a preference for “direct observation” over “inferential explanation.” So, in an effort to show that creationists are wrong for (allegedly) rejecting scientific inquiry into the past, Dr. Scott introduced the humorous example of a highway stripe painted over cattle dung on a remote road, asking the audience (to laughs), if we can’t figure out what happened just because we weren’t there (implying Ken Ham would use this logic). Specifically, the example showed a “logical sequence,” as Scott put it (comparing it to the geological law of superposition), of asphalt, covered with a highway stripe, covered with cattle dung, covered with another highway stripe. She then named the most obvious explanation for the sequence: that a cow had defecated on an existing, striped highway road, and that when the highway maintenance crew came through to paint fresh road stripes, they didn’t clean the dung off the road and instead painted the stripe right over top of it. Further attempting to tear down the straw man that creationists “prefer direct observation to inferential explanation,” Scott pointed out that in forensics, the testimony of witnesses (i.e., direct observation) is notoriously problematic. As many readers will be well aware, bystanders to a crime sometimes disagree over even basic facts such as what happened or what the perpetrator looked like. Inferential explanation vs. direct observation? Now, let me make it clear that, unlike Scott’s implication, creationists do believe inferential explanation is, on the whole, pretty accurate. If you return home and your dog is out of the cage with trash scattered about, it’s not unreasonable to conclude, based on past experience and circumstantial evidence (e.g., teeth marks on garbage, the dog’s dirty snout) that the dog is responsible. This sort of deduction can be quite reasonable when there are no observers and can be important even when there are observers—if they’re fallible (for example, the aforementioned witnesses to a crime). Likewise, Scott’s answer to her highway conundrum makes sense based on what we know about the behavior of cattle, the physics of highway paint striping, and so forth. But just as it seems foolish to conclude that inferential explanations are never right, it also seems foolish to conclude that inferential explanation—especially about unrepeatable historical events—is just as reliable as directly observing repeatable, carefully controlled scientific experiments. This is where we get into the distinction between operational (or observational) science and origins (or historical) science—a distinction evolutionists fail to recognize, by the way. For instance, a dog tearing up garbage isn’t a one-time event; it’s something that happens more regularly than most people would like, has been observed many times, and violates no laws of science. We could even set up a two-way mirror or hidden camera and document Fido’s destruction. But as for the differences: first, Darwinian evolution is based on conjecture about a one-time event that we cannot repeat experimentally; the “documentation” of the fossil record is actually just an interpretation of unevolving fossils that presupposes evolution.3 Second, Darwinian evolution violates the law of biogenesis. Third, there are good alternatives to evolution regarding the origin of life/biodiversity. These differences distinguish the dog-and-trash and the cattle-and-road-stripe examples from Darwinian evolution. Thus, it makes a difference whether the inferential explanation is based on experience and known laws and fits the evidence best, or whether it’s a guesswork-filled tale built on circumstantial evidence, layers of interpretation, and philosophical beliefs that, at the outset, arbitrarily deny the possibility of a supernatural intelligence. Ultimately, however—even considering the sometimes-correctness of inferential explanation—the question is what is more reliable: guesses about the past, or direct observation by an omniscience who cannot lie? It makes a difference when there is an authoritative account of events. When it comes to a crime, police may not trust the shaky account of a confused witness, but they would certainly give heed to the (relatively) “infallible” recording of a security camera. How much more trustworthy is God, who was there, knows all, and cannot lie? So the existence of a possible designer is (apparently a priori) “less probable”? I wanted to shoot up my hand immediately to interrupt: what if there was ample evidence for time travelers or extraterrestrials? What if we specifically knew of a mischievous alien race that loved to sneak on earth and arrange such farcical pranks? Would we be more “scientific” if we ignored this evidence and dismissed such a possibility as “less probable”? In the case of creationists, we believe there is a God (that is, we believe His existence is more than “probable”! ), we believe it was in His character to create, and we believe He outright told us He did create. Why would evolutionists like Dr. Scott expect us to be so credulous to buy into this sort of logic when it, in essence, claims that a creator God is “less probable”—even though, as we’ll see later, Scott claims God’s existence isn’t a scientific issue? Her example made it crystal clear that her atheism has a definite influence on her willingness to accept evolution. If the possibility of creation, even by extraterrestrials, is considered “less probable” prima facie (on nonscientific grounds), then what else is she left to believe in but evolution? One’s recognition of God is the dominant factor in what one believes about origins. What I’ve tried to make clear so far is that one’s belief about God does make a difference in how one understands science and what one thinks about the origin of life. Specifically, while creationists do value inferential explanation, we value the authority of an infallible, direct observer over inferential explanations that start out by arbitrarily decreeing that a designer is “less probable” (ruling out supernatural explanations). An agnostic might respond, “I see how your religious beliefs (which fall into Scott’s categories of authority and personal states of being) override actual science. But those religious beliefs are taken on faith, whereas science is verifiable. That’s why I only accept scientific facts.” Let’s answer that argument in the context of Scott’s next series of comments. Scott identified the core as containing “really well supported” scientific paradigms, the frontier as containing areas of active research that extend the core, but lack experimental verification, and the fringe as containing doubtful or generally rejected models, such as creation science and intelligent design. Scott acknowledged that “sometimes fringe ideas become frontier ideas become core ideas,” but apparently only so that she could point out that science, as a self-correcting, “open-ended” way of knowing, is thereby beyond reproach for excluding ideas or having any biases. However, notice that even when we find data that points to design, such as irreducible complexity, Darwinism is not considered falsified or challenged. In fact, we argue that nothing evolutionists find would be considered enough to falsify evolution, because Darwinism isn’t just another falsifiable hypothesis that’s made its way to the core; rather, it is a presupposed, foundational paradigm that is used to interpret the actual facts. One might suggest that, even if Darwinism is a paradigm rather than a simple hypothesis, the evidence would still help scientists choose between competing paradigms (as though they were competing explanatory hypotheses). But facts don’t speak for themselves; they must be interpreted through a paradigm. Interpreting facts to prove a paradigm is thus ultimately an exercise in circular logic. Furthermore, since the only paradigms that challenge Darwinism are design-based, there is effectively only one paradigm to chose from for those like Scott who reject that science can discover intentional design. Of course, keep in mind that “no one becomes a scientist for factual certainty,” as Scott laughed. This is because the scientific method can’t prove anything; it can only disprove falsifiable hypotheses. Those never disproved are eventually developed into scientific theories. And furthermore, as stated, we do not believe evolution would be falsified experimentally, anyway, since it is the paradigm by which evidence is interpreted. The next slide revealed the three “first principles” that Scott ascribed to science: three assumptions that science requires in order to function. There is an objective reality outside of the individual. The universe operates according to regularities. Human beings can understand these regularities. My point was that the basic axioms of science—the assumptions Scott outlines—are themselves not testable by scientific methods (neither by experimentation nor by scientific inference). Thus, science itself rests on assumptions which are not scientific: at the heart of science are philosophical axioms that can’t be proven scientifically. So on what grounds should someone accept those axioms instead of biblical truth, or instead of postmodern relativism? Of course, Scott cannot claim that scientific assumptions lead her to prefer scientific knowledge, since that would be circular reasoning.4 So, either Scott accepts science on authority (she has faith in someone or something that tells her the scientific assumptions are better than other assumptions) or she accepts science based on a personal state (such as her own personal emotions/experience that aren’t transferable to someone else). She has attacked both authority and personal states of being as the domain of religions, pointing out that they lack the verifiability of science, yet this is where she must lay the foundation of science! As creationists, we likewise believe science requires some basic assumptions—such as the clear foundation found in God’s Word, since we know God has created an orderly, objective reality that operates according to regularities.5 As such scholars as Rodney Stark (in For the Glory of God) have concluded, belief in the Creator God is a requisite foundation for belief in a logical, orderly, understandable universe. Scott then presented what she titled as her “goldfish theory of epistemology.” Dr. Scott has two goldfish, it seems, and Dr. Scott—not her husband—is the one who feeds the goldfish. (Whether the illustration is true or fictional was not clear.) So what if one of the two goldfish makes the connection that one shadow approaching the fishbowl means food is on its way, whereas the other shadow has nothing to do with food? It’s “goldfish brilliance,” Scott joked. Her point was that the goldfish, being so limited in their tank, have a very poor ability to comprehend their surroundings. The best that they could theoretically do is make some correlative connections between, e.g., shadows and food. Science can’t produce factual certainty. Science is based on untestable philosophical assumptions. Essentially we may misunderstand the entire world—we may just be goldfish! That’s my response to those who claim they can avoid religion and stick to “just the facts”: science—and factual certainty—are impossible without philosophical presuppositions, and all philosophical presuppositions lie in the religious domains of authority and personal states of being—exactly what naturalistic scientists claim to avoid. Who Sets the Limits on Science? “There is the assumption out there,” Scott explained, “that there is something out there [other than us].” Scott listed mystical or personal states of being, belief in an afterlife (in most religions), and concern with morals/ethics as other key elements of religion. Scott then introduced a table to compare science and religion. Originally, this was all the table compared; Scott revisited the table a few minutes later and added a column comparing materialism as well. To save space, we’ll just show the final version of the table. Mystical/personal states of being Yes No ? “Science is limited to explaining the natural world, using natural processes,” Scott once again emphasized. Now here’s our question in response: in the last five rows of her table, notice that Scott labels science as essentially neutral between religion and materialism, or equally disinterested in both. Yet there is one key issue where science, according to Scott, sides with materialism: row four, the question of whether supernatural powers intervene. Thus, according to her definition, science is naturalistic and rules out supernatural intervention. But what does this mean for a Christian, since Scripture is quite clear that God has “intervened” (to say the least!) numerous times in history? According to Scott’s perspective, must Christians essentially lie to themselves in order to understand science according to her definitions? Presumably Scott would also expect Christians to reject the Resurrection as well—that whenever science conflicted with religion, science would supercede, and religious scientists would push their religious stories into a “parable” interpretation. But what is it about the scientific method that requires the absence of any supernatural intervention? Why can’t Scott be neutral on the question of supernatural intervention, particularly if the facts point in that direction? Why must Scott restrict the ability of science to indicate design? Are Scientists “All a Bunch of Atheists”? Note that her first alleged tenet is not actually true; granted, we believe the original created kinds were more similar to today’s kinds than an evolutionist’s amoeba is to today’s life. But nonetheless we do accept change in life-forms, albeit downward change—“devolution”—in which populations of a created kind adapt to their environment by losing genetic information. For example, a population of dogs living near the Arctic would lose the information for short hair as the population adapted to the cold. This matches up with Scott’s second point. Scott accurately illustrated our outlook by explaining, “cats and dogs would not have a common carnivore ancestor” in the creation model. That’s true; we believe modern cats and dogs are each from a unique created kind (the cat kind and dog kind, of course!). We believe this is based squarely on the evidence: observational science confirms breeding and genetic variation within the cat kind, and likewise within the dog kind, but there is no evidence of a cat–dog transitional form / common ancestor. Next, Scott attempted to tackle the creationist allegation that “scientists are all a bunch of atheists.” Of course, that allegation is itself an allegation, since we point out that many scientists are young-earth creationists and even more question Darwinism. What we (and other creationists) have claimed is that evolutionary belief is itself a (presupposed) religion that both often leads to atheism (or, at least, agnosticism) and is more often accepted by atheists. After all, how can anyone so confidently “know” creation “didn’t happen” without believing first there isn’t a god who could have created? We also point to many who have lost their faith because of evolution (vs. very few who report a stronger faith after accepting Darwinism), as well as to evolutionists themselves (including some of Scott’s colleagues) who have discussed how evolution confirmed their atheism. Of note is Richard Dawkins, who claimed Darwin’s theory made it possible for the first time to be an “intellectually fulfilled atheist.” And, of course, Darwin himself was skeptical of God. But Scott pulled up a table showing survey results of individuals asked about their belief in a deity, with scientists’ answers broken down separately. She glossed over the data, pointing out that a fraction of scientists report that they do believe in God—which is true, of course—though noticeably ignored was the clear fact that a plurality of scientists answered atheistically, in stark contrast to the results of the survey group as a whole. Apparently wanting to heap ridicule on all creationists, Scott showed slides of flat-earth and geocentric creationists as the audience laughed. She also highlighted strange, idiosyncratic views of old-earth creationists—again to audience laughter. This was frustrating since these views don’t apply to AiG and most young-earth creationists, yet the audience presumably didn’t know that, although Dr. Scott should. To illustrate these views, Scott presented a spectrum. On one end was “CREATION”; on the other, “EVOLUTION.” Along the way, there were a variety of views listed. Beginning with the end of the spectrum closer to creation . . .
. . . and concluding at the end of the spectrum labeled evolution. “Materialism, or naturalism if you will, is the idea” of those at the far right of the spectrum, said Scott, who illustrated their beliefs by quoting Richard Dawkins assertion that there is nothing but “blind, pitiless indifference” in the universe. However, Scott noted that there are two kinds of materialism/naturalism: methodological materialism and philosophical materialism. According to Scott, methodological materialism means that, whether you are religious or not, you stick to the rules “when playing the game of science,” ruling out any supernatural explanations. On the other hand, philosophical materialism means you rule the supernatural out completely, all of the time. But, again, what gives Scott the right to define science as materialistic for Christians? Wouldn’t Scott’s restriction effectively force Christian scientists to either lie or place their beliefs in an artificial “parable” box? And what about science requiring a fundamental adherence to methodological naturalism? In short, why play the materialistic edition of the “game of science” at all—or listen to those who are—especially if you’re a Christian? It’s no different than playing the “game” of philosophy by starting at the outset to rule out God. Academic disciplines that start without acknowledging God, let alone those that reject God from the get-go, should be held as suspect by Christians. 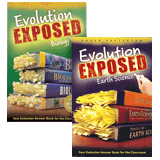 Scott asked why teachers can, for example, teach about enzymes without saying, “and God had nothing to do with it,” implying that creationists only reject methodological materialism when it comes to origins. Although she didn’t wait for an audience response, I would have gladly answered her by explaining that Christians are never materialistic; however, we do believe God set up a universe that runs according to natural laws most of the time. When God tells us He overrode the laws He created (such as in Scripture), we can acknowledge the miracle without deciding that nature is therefore arbitrary, just as a computer engineer can override his own programming without invalidating it entirely. “I would like science to be an ‘equal-opportunity’ epistemology,” Scott claimed. On the screen, she showed an image with the word “science” at the bottom, and pictures of Richard Dawkins and (theistic evolutionist) Francis Collins above, on the left and right, respectively. Arrows pointed from “science” to each individual, while Scott explained, “[Science] can be used to support either view,” then added, “but leave it out” as a line separated “science” from the two men’s images. In other words, you can believe whatever you want to believe—except when it comes to origins! No wonder Scott lauded Christians who “accommodate” evolution; since they play her version of the game of science by “parable-izing” (one might say “paralyzing”) their religious beliefs. Otherwise, how can Scott expect her model of science to be usable by theists when she defines it as eliminating the supernatural from the start? My conclusion from her lecture was straightforward: science and religion can peacefully coexist, as long as religion bows to science whenever they conflict. After enthusiastic applause, Dr. Scott said she would take questions. My hand shot up from the beginning, but I was one of several who weren’t invited to ask our questions before time ran out. However, the other questions were very interesting and covered several topics. The questioners also seemed to represent various viewpoints. Q: In The God Delusion, Richard Dawkins argues that science can and does say something about whether there is a god, through probability arguments, and thus the hypothesis that there is a god must be either right or wrong. Therefore, science does not give “equal opportunity” to atheism and theism. What do you think? Scott: I would choose a different form of argument for that question. I agree with Dawkins’s probability arguments, but science can’t prove them. Ultimately there are two kinds of people: people who believe in some sort of immaterial reality, and people who don’t; the latter are fewer in number. It just comes down to “what makes the most sense to you.” I’ve known atheist evolutionists who have become young-earth creationists and vice versa, but “all have had some sort of emotional experience” and response that changed their mind. What’s also interesting is Scott’s comment that it comes down to “what makes the most sense to you” and an “emotional experience” to choose between theism and atheism, and between creation and evolution. Since these presuppositions form the basis for one’s ideas regarding science, it seems Scott would agree that, ultimately, creation/evolution is not a scientific question, but rather a religious question rooted in one’s presuppositions. Q: Couldn’t philosophical materialism be considered a religion? Scott: It’s rather a belief about non-religion. We’ve long said that secular humanism and evolution are as religious as Christianity and creation. They are all presupposed philosophical beliefs about the origin, meaning, morality, and ultimate result of life. And don’t just take our word for it—read about proposed concepts for worshipping science or “scientific alternatives to religion,” too! Q: What’s the difference between creationism and intelligent design? Scott: Creationism is basically young-earth creationism, of which intelligent design is a subset in the sense that “everything in intelligent design preexisted in young-earth creationism,” but many claims in creation science are ignored by intelligent design (e.g., age of earth, Noachian flood). First, Scott’s comment strangely ignored old-earth creationism, though she perhaps accurately understands that many old-earth views are closer to theistic evolution than creation. As for her comments on intelligent design, she is right that intelligent design is, in a way, a sort of stripped-down version of creationism that removes the “religious” content and focuses solely on showing design, not on pointing people to the Designer; although one could also reasonably argue that biblical young-earth creationism is a subset of ID, in that it limits the designer to being only one possibility. Q: There is a kind of knowledge not on your chart: conceptual knowledge (e.g., mathematics, knowledge of infinity). Without that form of knowledge we must use religion or relativism for morality. In other words, the questioner challenged Scott’s original three-fold model of epistemology that had sections for authority, personal states of being, and science, with the valid point that mathematics doesn’t fit in any of those areas of knowledge. But Scott’s response was confusing. Q: Judge Jones concluded intelligent design was merely a camouflage. Can you comment on role of DNA used as gold standard to show common descent, etc. Scott fell back on old canards, such as suggesting that Noah had to take beetles on the Ark (he didn’t), or that kinds could be species. But remember: the diversity of life we see today is due to the loss of genetic information, not a gain, so it’s not so difficult to imagine how the descendants of the creatures on the Ark gave rise to the diversity of life we see today. Q: Intelligent design advocate William Dembski has suggested that the definition of science should include supernatural. What is your response? Scott: “It doesn’t get us any place to say that God did it.” Chalking something up to design would be problematic because we wouldn’t be able to distinguish between various creators. As for distinguishing between potential creators, this is a common argument of Richard Dawkins. One of his stock responses to theistic arguments is to ask, “which god” and fill in the names of, e.g., Scandinavian deities.) But actually, on this point, we agree with Scott and Dawkins: one of the problems of the Intelligent Design Movement is that while it does a very good job of showing examples of design, it stops short of identifying the Designer. For that, we need the special revelation of God’s Word. The irony is that the “designer uncertainty” of the Intelligent Design Movement actually seems to destroy the evolutionist argument that it is religion in camouflage. In other words, by asking “which designer,” evolutionists prove that the Intelligent Design Movement doesn’t teach any religion; after all, the designer “could be” an extraterrestrial. Q: What about the idea that there are actually two worldviews or paradigms, evolutionist and creationist, and each explains the science? Creationists have long said that there are certain things, like oil and diamonds, that don’t take a long time to form, whereas evolutionists say these things take millions or billions of years to form. But now we read about scientists making such things in the lab in a very short period of time. Scott: There is “a lot of literature out there” on why young-earth evidence is wrong, such as that the canyon carved so quickly at Mt. St. Helens was unconsolidated ash. Note that Dr. Scott did not respond to the examples given, but rather gave one strawman example of creationists implying that Mt. St. Helens canyon formations are exactly analogous to Noachian-formed ones (the point being that both canyons were formed by catastrophic processes, and that both were made in not-fully consolidated rock). Meanwhile, there’s plenty of other evidence supporting a young earth. Our main point, however, is not that evolutionists don’t interpret the facts in support of long ages; it’s that each camp must make assumptions about the past—e.g., rates of sedimentation—in order to extrapolate an age for the earth. Q: What is it about American society that makes disbelief in evolution so common? Scott: “Oh my.” [A woman in the crowd loudly enthused, “Great question!”] There are historical and cultural reasons, such as the dissident foundation of the United States, including the congregationalism and the “bring your own theology idea of religion” that came as part of a backlash against established European churches. Scriptural fundamentalism was developed and adhered to much more strongly in the U.S. than in Europe. There is also poor college-level teaching of evolution, especially to future high school teachers—the “trickle down” of bad teaching—and the decentralized, politicized educational system of the U.S. that allows the “noisiest” people to get their curriculum accepted. We wouldn’t think of allowing reproductive health education to be based on street wisdom, would we? We agree that the church in the U.S. has maintained a higher regard for Scripture than the church in some European countries—though that isn’t necessarily saying a lot. The creation movement has been blessed with opportunities to speak and distribute information around the world, but especially in the U.S. But Scott is wrong to imply that the U.S. educational system has allowed creationist curricula to be put in place; her organization combats any curricula that even questions Darwinism! She may spin it as “street wisdom” and the pushing of the “noisiest”; it can just as easily be presented as a strong movement for academic freedom in the U.S.! Although disappointed that I didn’t get to ask either of my questions (the first would have been similar to my comments in “That’s not very probable”; the second similar to my comments in Is science scientific? ), I left the lecture only more convinced that, at its heart, evolution and materialistic science are rooted in presupposed secular humanism, which rules out a Creator from the start. Scott and others like her are happy to say that religion and science can get along, but only if Christians “play the game” of science their way by setting up materialism as the authority over Scripture. NOMA, an acronym for non-overlapping magisteria, presents the idea that science and religion are non-exclusive “magisteria” that answer separate questions about the world: science explains how and why things work, and religion answers why things have value and what is right and wrong. For those whose religions have no interface with the natural world (e.g., no incarnate deity, no special creation, no miracles, no Resurrection), NOMA may seem like a reasonable conclusion: a “live and let live” attitude toward materialistic scientific investigation and mystical religion. But for religions that say something about the world, such as Christianity, NOMA seems a useless concept that brings one back to the question of which to believe. Rather, the most well-known source is a passage in the writings of Thomas Jefferson, where it contextually refers to protecting religious groups from the government, not the other way around. It’s important to differentiate testable, observable natural selection—which was a scientific hypothesis propounded and accepted by creationists before Darwin and still accepted by creationists today—from “molecules-to-man” evolution. See Is Natural Selection the Same Thing as Evolution? for an explanation of the many differences. Actually, as Bible-believing creationists, we believe that all reasoning is ultimately circular, because as fallible beings, humans must make certain assumptions before reasoning—such as the assumption that reasoning is possible. We do acknowledge that God can suspend His general scientific laws, hence, miracles; however, this does not mean creation scientists resort to “miracle!” unless there is a preponderance of evidence against natural explanation. As we noted earlier in the article, however, the authoritativeness of the revelation does come into play; a fallible crime witness’s word means much less than the infallible Word of the Creator. My guess would be that many evolutionists might counter-respond, “But the creation model has to force science into the pre-existing biblical paradigm; creationists can’t follow the evidence wherever it leads.” However, evidence doesn’t speak for itself; it has to be interpreted. An “ancient” fossil is therefore interpreted/forced by evolutionists into the pre-existing Darwinian paradigm; evolutionists can’t follow the evidence wherever it leads, either.